Delhi-based Advergame Technologies Pvt Ltd, that operates mobile-based gaming network app Gamezop, has raised $350,000 in a seed-funding round led by Delhi-based talent management firm KWAN Entertainment & Marketing Solutions Pvt Ltd. Existing investor US-based Powerhouse Ventures also participated in the round. The round also saw participation from TracxnLabs and Germany-based AECAL as well as angels Anand Chandrasekaran (chief product officer, Snapdeal), Phanindra Sama (founder, redBus) and Vinay Menon (MD, Equity Capital Markets, JP Morgan), it said in a press release. The funds will be used to invest in technology, distribution alliances and talent recruitment. "Popular forms of digital entertainment such as music or videos already have platforms that serve as one-stop destinations. However, in gaming one only hears about individual titles. We are building a platform to make gaming reach the inflection point that the others have already witnessed," said Gaurav Agarwal, CEO of Gamezop. Agarwal said at 135 per cent CAGR, India is one of the world's fastest growing mobile gaming markets and is projected to grow to $600 million by 2016. However, it is still untapped by global standards. Founded by brothers Gaurav Agarwal and Yashash Agarwal in April 2015, Gamezop is a mobile app-based social network for casual games. Each user will be given a handful of new games each week, which can be played without downloading. In May 2015, Gamezop was one of the eight startups shortlisted by GSF Accelerator—launched by former Reliance Entertainment president and GSF Superangels founder Rajesh Sawhney—for its mobile accelerator programme. Casual games refer to those which can be played on the go and do not need a lot of instructions. The idea is to make gaming experience less complex. Gamezop's offerings are based on HTML 5 platform, which means they are both platform as well as device agnostic. 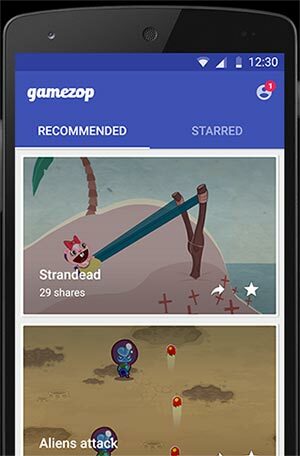 Currently, Gamezop is available only on Android. "Removing the download-deletion fatigue, providing offline access to online games and bespoke game recommendations to cut clutter are huge value additions," said Rajesh Sawhney. India-based gaming startups have elicited a lot of investor interest in recent times. In December last year, Bangalore-based mobile gaming company Mech Mocha Game Studios Pvt Ltd raised $1 million in seed funding from Flipkart and Blume Ventures. In November last year, Octathorpe Web-Consultants Pvt Ltd, a Hyderabad-based company that makes mobile game apps and computer games, raised $250,000 from Chennai Angels. Likewise, Bangalore-based Moonfrog Labs Pvt Ltd raised $15 million from Tiger Global and existing investor Sequoia Capital in March last year. In December 2014, Sequoia backed another mobile game developer Octro-creator of popular games like Teen Patti and Rummy—with $15 million. Advergame Technologies Pvt. Ltd. Gamezop Kwan Entertainment and Marketing Solutions Pvt. Ltd.